Regulators shutter banks in four states Friday evening. NEW YORK ( TheStreet) -- Four banks failed on Friday, bringing this year's total number of bank failures to 28. All four failed banks were previously included in TheStreet's Bank Watch List of undercapitalized institutions, based on regulatory data provided by Thomson Reuters Bank Insight. The Oklahoma State Banking Department shuttered First Capital Bank of Kingfisher, which had $46.1 million in total assets and $44.8 million in deposits. The Federal Deposit Insurance Corp. was appointed receiver, and sold the failed institution's deposits for a 7.65% premium to F&M Bank of Edmond, Okla. In addition to purchasing the deposits, F & M Bank agreed to take on $40.7 million of the failed bank's assets, with the FDIC retaining the rest for later disposition. First Capital Bank's office was scheduled to reopen Saturday as a branch of F&M Bank. The FDIC estimated that the cost of First Capital Bank's failure to the deposit insurance fund would be $5.6 million. The Office of the Comptroller of the Currency closed Carolina Federal Savings Bank of Charleston, S.C., and appointed the FDIC receiver. The failed bank had $54.4 million in assets and $53.1 million in deposits. The FDIC arranged for Bank of North Carolina, of Thomasville, to assume the Carolina Federal Savings Bank's deposits, while also purchasing roughly $41.0 million of the failed banks assets, with the FDIC retaining the rest of the assets for later dispoisition. The acquiring bank is held by BNC Bancorp ( BNCN. Carolina Federal's two offices were set to reopen during normal business hours as Bank of North Carolina branches, operating under the name BNC Bank. The FDIC estimated that the cost of Carolina Federal Savings Bank's failure to the deposit insurance fund would be $15.2 million. The Illinois Department of Financial and Professional Regulation shut down Farmers and Traders State Bank of Shabbona, which had $43.1 million in assets and $42.3 million in deposits. As receiver, the FDIC sold the failed bank to First State Bank, of Mendota, Ill. The failed bank's two branches were scheduled to reopen as Saturday as First State Bank branches. The FDIC estimated that the cost of Farmers and Traders State Bank's failure to the deposit insurance fund would be $8.9 million. State regulators closed Waccamaw Bank of Whiteville, N.C., which had total assets of $533.1 million and $472.7 million in deposits. The FDIC sold the failed institution's retail deposits to First Community Bank of Bluefield, Va.
Customers of Waccamaw Bank with deposits made through brokers need to contact their brokers directly, who will be paid directly by the FDIC for insured deposit amounts. The FDIC estimated that the failure of Waccamaw Bank would cost the deposit insurance fund $51.1 million. 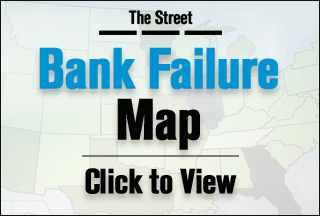 The bank failure map is color-coded, with the states having the greatest number of failures highlighted in dark gray, and states with no failures in light green. By moving your mouse over a state you can see its combined 2008-2011 totals. Then click the state to open a detailed map pinpointing the locations and providing additional information for each bank failure.